I purchased a graphghan pattern from someone and I couldn’t not seem to make it work. I went about trying to make my own, and it is A LOT less detailed. This is for my nephew, whom I am extremely proud of, as his graduation gift. He actually graduates in the winter, a semester early. He is the best! This will be an awesome gift and a treasure for him. Great job! Thank you so much! I think it took me a million years to complete! Beautiful! I crocheted a graphghan for my son too! He graduated from UCSF med school in May. 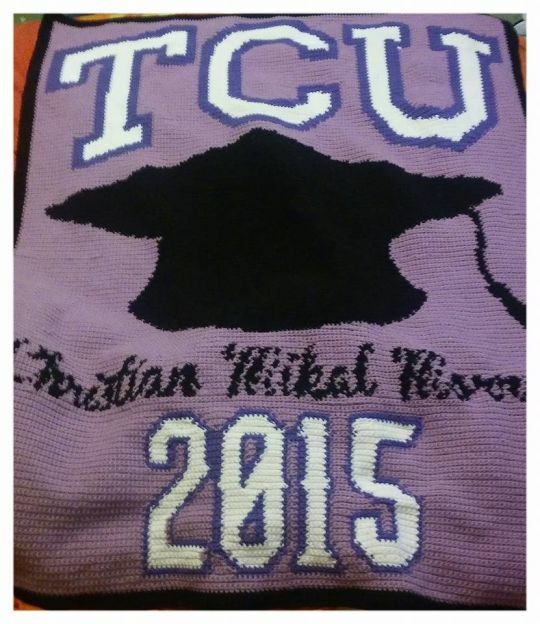 Could you tell me where you got the pattern from as I would like to make one for my daughter who is graduating in May. Please and thank you.